In a maintenance project whenever we receive a change request ticket from the customer, it is first analyzed by the developer. The developer determines whether it is a bug or an enhancement. Sometimes it can be neither. In such cases it is identified as an issue in user understanding. Once an issue is identified as a bug or enhancement then it is logged in the CR log for prioritization. Identifying any existing requirements in the baseline that conflict with the proposed change. What are possible adverse side effects or other risks of making the proposed change? Will the change affect any system component that affects critical properties such as safety and security, or involve a product change that triggers recertification of any kind? How will the proposed change affect the sequence, dependencies, effort, or duration of any tasks currently in the project plan? Will the proposed change adversely affect performance requirements or other quality attributes? Once the Impact analysis is done we estimate the effort to fix the change request in the system. This estimate includes the code changes, testing and other activities such as deployment and release. The priority list is based on the criticality of the Change requests submitted by the client. 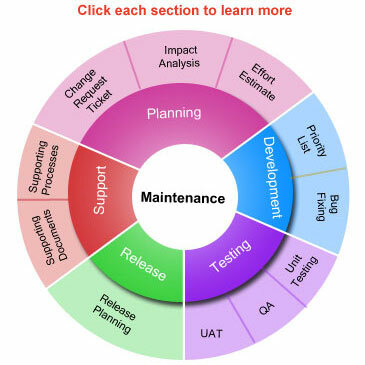 After the change request is analyzed and effort estimation is completed it is given a priority in the priority list. Based on its urgency and effort required to complete it the priority is assigned. Then, it gets assigned to a version release. The requests which are at the top of the list are fixed in the foremost release. This process keeps going on. Once the priority list is decided for a particular release it is given to Developers for fixing. Each bug/enhancement is assigned to a developer who then documents the bug in the design document and fixes it by making changes to the code. After the code changes are done the developers carry on unit testing for that particular piece of code to make sure nothing else is broken. Unit testing is a method of testing that verifies the individual units of source code are working properly. This is done by the Software engineers. The goal of unit testing is to isolate each part of the program and show that the individual parts are correct. A unit test provides a strict, written contract that the piece of code must satisfy. Unit tests find problems early in the development cycle. This reduces a lot of effort on review and rework at a time of QA. Internal program logic is exercised using “white box” test case design techniques. Software requirements are exercised using “black box” test case design techniques. In both cases, the intent is to find the maximum number of errors with the minimum amount of effort and time. A set of test cases designed to exercise both internal logic and external requirements is designed and documented, expected results are defined, and actual results are recorded. When we begin testing we change our point of view. We try hard to “break” the software! This way we catch most of the bugs/issues before the application actually gets deployed at the client’s server. User Acceptance Testing (UAT) is a process to obtain confirmation by a Subject Matter Expert (SME), preferably the owner or client, through trial or review, that the software meets mutually agreed-upon requirements. The UAT acts as a final verification of the required business function and proper functioning of the system, emulating real-world usage conditions on behalf of the paying client or a specific large customer. If the software works as intended and without issues during normal use, one can reasonably infer the same level of stability in production. After the Client signs off the UAT and accepts the application we deploy it on the Servers specified by the client. With each system we develop a Deployment Plan to ensure that the system deployment carries on smoothly and we don’t miss any step. This plan includes a Web Deployment Guide, Setup document and Deployment Checklist. This plan also includes the steps to rollback in case the application fails. The post deployment support includes resolving any issues with respect software configuration. We take care of any problems that arise out of Software configuration issues, software incompatibility etc. The Post deployment support is given for a period of up to 5% of the total project duration. So, if the project is for 1000 hours the post deployment support will be for up to 50 hours.